The Woolsack has been upgrade for 2019 from a 1400 spring unit to a new 1750 pocket spring unit , also all pocket springs are now centre tied for a greater support. The Woolsack model is now the middle model in the 9 nine strong Relyon Heritage pocket spring collection. The Relyon Heritage collection Woolsack offers a little bit for luxurious feel than the Braemar 1400 as it is made with 1750 centre tied pocketed springs in a standard 150cm king size mattress along with sumptous thicker layers of lambs wool, cashmere, silk and anti allergenic layer. this is all encased under a new softer more luxurious damask cover. 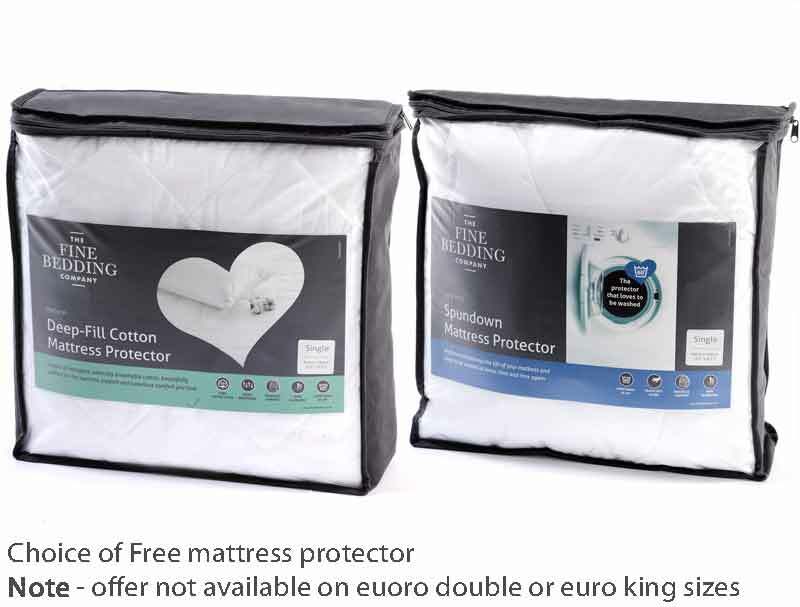 The Woolsack mattress is available in 2 tensions medium or firm and is fully turnable. 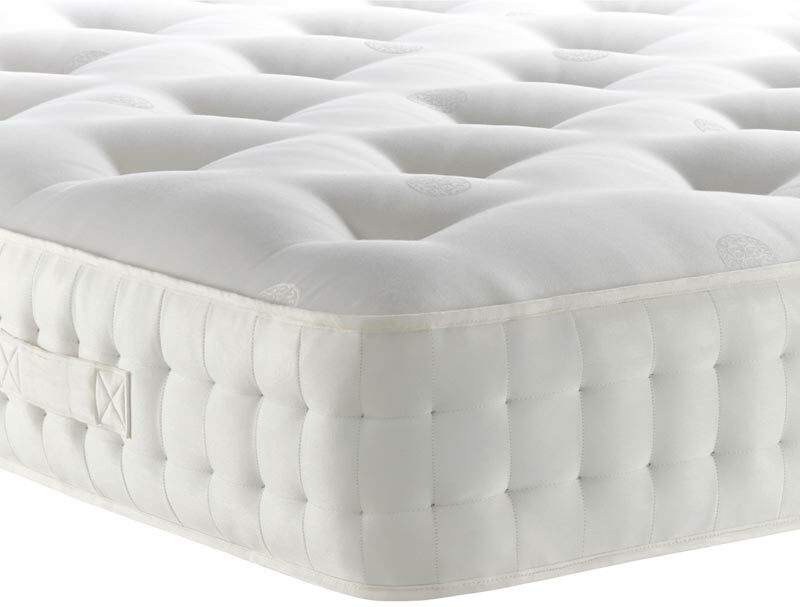 The mattress has also been reinforced with 2 rows of genuine hand side stitching for greater support at the edge of the mattress. 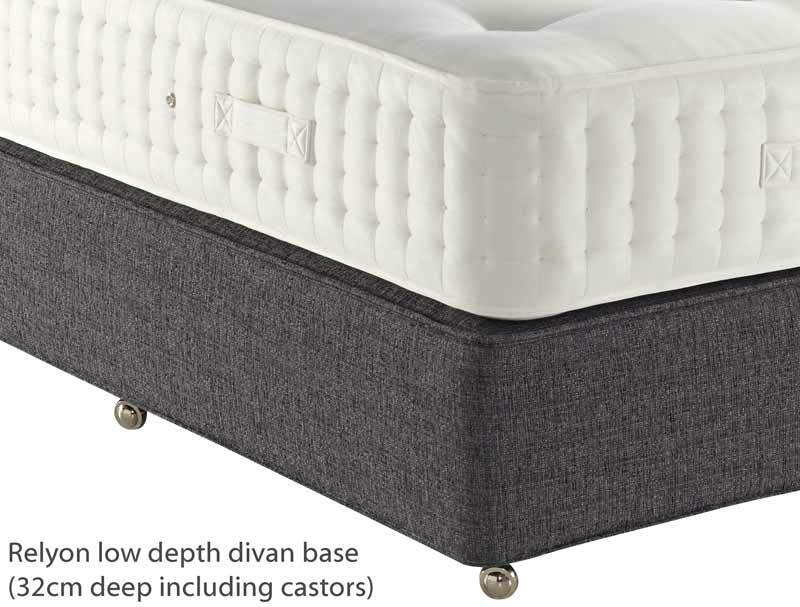 The mattress comes as standard on a padded top deep or low base or a base on legs. 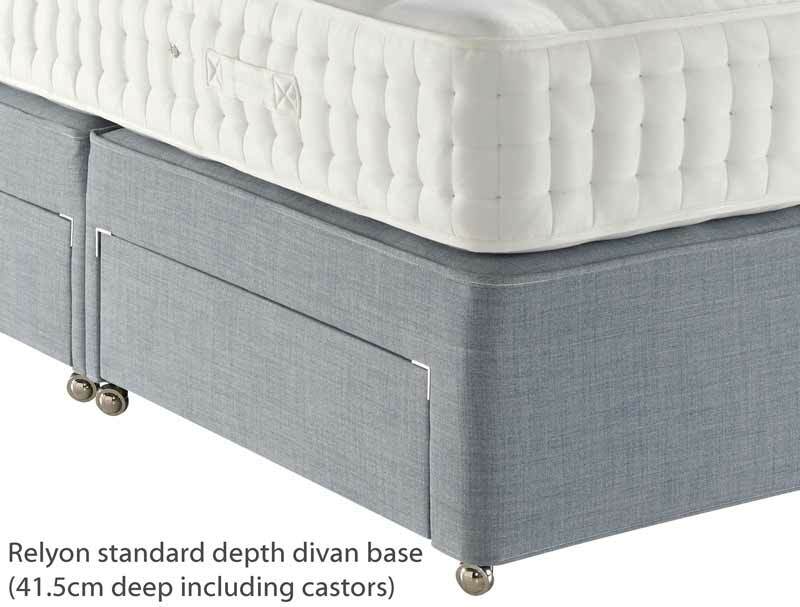 You can increase the comfort by selecting a Firm edge (hard at sides sprung in middle) pocket spring base. The platform top hard base on legs is 31cm deep. Or the other bases are standard 41.5cm deep or 31cm for the low base. 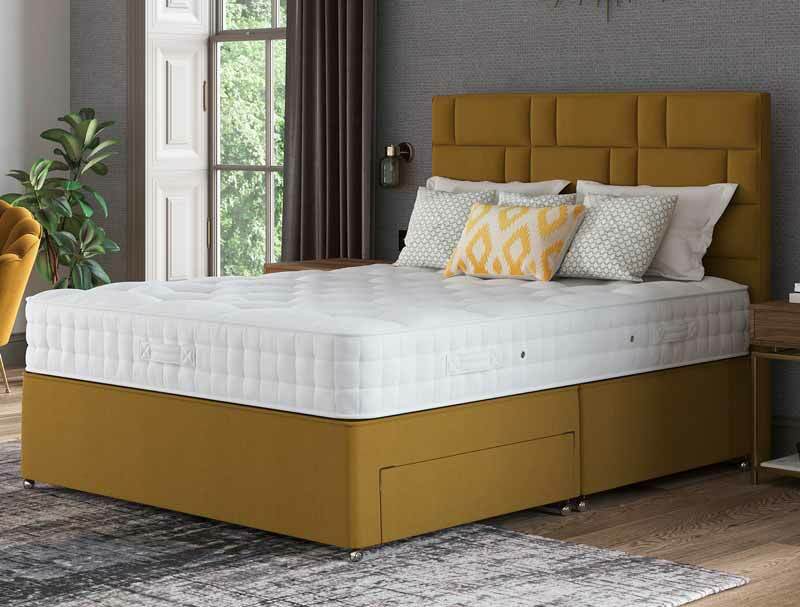 The bed base comes as standard in 6 fabric colourways, however you can upgrade to over 30 contempory fabrics like the Otter brown colour pictured. Drawers are another option currently you get 2 drawers free of charge (normally £100) or you can upgrade to a 2+2 or 4 Drawer combination for £100 (normally £200). 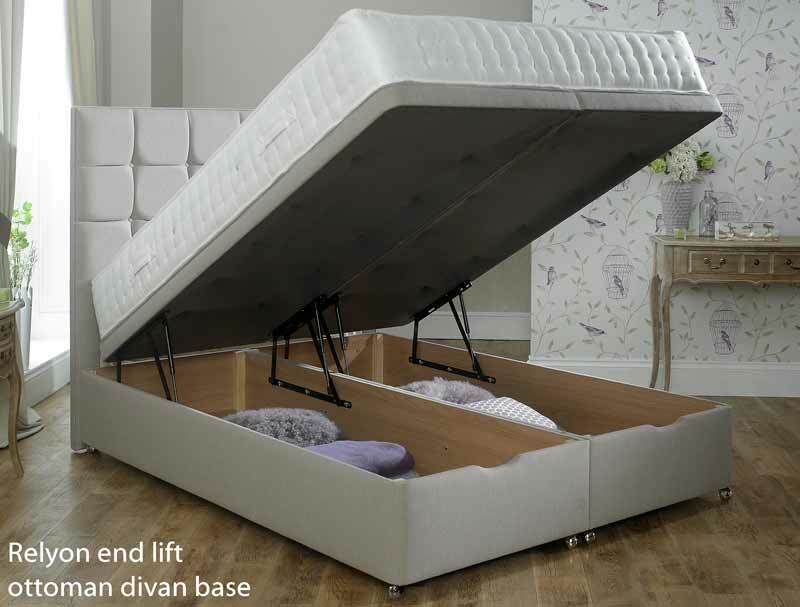 If you require maxium storage why not upgrade to a end open ottoman base which will offer up to 5 times more storage space than 4 drawers. The Headboard pictured is a deep buttoned floor standing extra height wide headboard in otter brown which is extra and is not included in the price. All new Relyon beds have improved bases with more wood in the frame and captive drawer runners.